TEMPE, Ariz. — Although the Arizona Cardinals went down to their seventh defeat of the season, there were positive aspects to their 26-14 loss at Kansas City. David Johnson broke loose for his best game of the year and the Cardinals defense harassed Chiefs quarterback Patrick Mahomes better than anyone has all season. Johnson, who had been bottled up through the first half of the season as part of the worst-ranked offense in the NFL, accumulated 183 yards from scrimmage — 98 yards rushing (in 21 carries) and 85 yards receiving (on seven catches). Johnson scored both of Arizona’s touchdowns, on a nine-yard pass from Josh Rosen and a one-yard run. It was the second game for Arizona with Byron Leftwich as offensive coordinator. Johnson has topped 100 yards from scrimmage in each of the past two games after failing to do so in the first seven of the season. Arizona used up 6:01 in its first touchdown drive and 7:12 in the second. The Cardinals had the ball down 26-20 and Rosen’s 23-yard pass to Johnson put the ball on the Arizona 40 early in the fourth quarter. 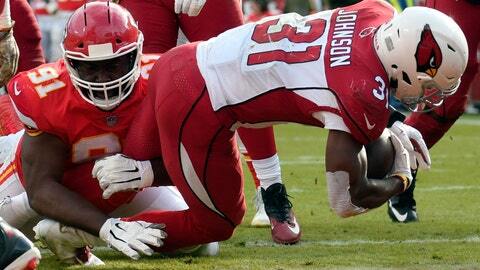 But Rosen’s screen pass, intended for Johnson, was intercepted by Justin Houston at the Cardinals 35. That led to a Kansas City touchdown. After that, Rosen was battered behind some shaky pass protection as Arizona was forced to mainly abandon the run. On defense, poor play in the Arizona secondary led to a quick Kansas City touchdown on the game’s first possession. But the Cardinals were tough after that, sacking Mahomes five times — two by Chandler Jones. Mahomes had never been sacked more than twice in a game before Sunday. The 26 points were a season low for Kansas City. It might have been about as good as the Cardinals could have expected on the road against the Chiefs, who improved to 9-1. The Cardinals will find themselves in the unusual position of being favored on Sunday when they host the Oakland Raiders. NOTE: Wilks said he hadn’t received the results of an MRI on right guard Justin Pugh‘s injured knee.